Together with Channel Insurance Brokers, who have made us their chosen Charity of the Year, we will be organising a Sunday Lunch fundraiser on 14th October 2018. Please click here for more information. Save the Date..........2019 Sunset Walk !!! Martin Search from Ray & Scott is very kindly holding a promotional evening on behalf of the Pink Ladies on Thursday 7th June. Please click here for more information. The Soroptimists are organising afternoon tea at Government House on Saturday 18th November in aid of the Pink Ladies. If you are interested in joining the event, get in there quick as tickets are limited. Please click here for more information. The staff of Mourant Ozannes held a raffle (all prizes donated from local businesses), a cake sale and collected dress-down money. Please click here for more information. There will be a Christmas Coffee Morning in aid of Cancer Research UK, held on Wednesday 9th November and everyone is welcome ! Please click here for more information. EXTREME father and son bonding will take place for two locals later this year as they cycle from Guernsey to Biarritz in just six days. Please click here for more information. 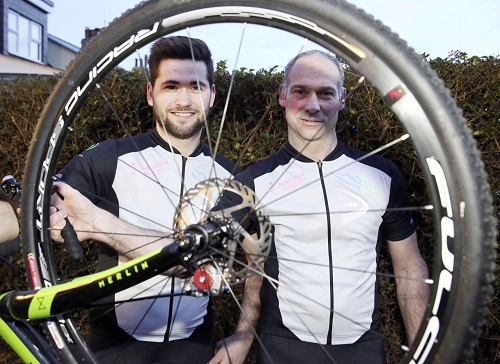 Father and son Nigel and Jake Salmon are hard in training to cycle from Guernsey to Biarritz; all to raise funds for both MUG and the Pink Ladies Please click here for more information. 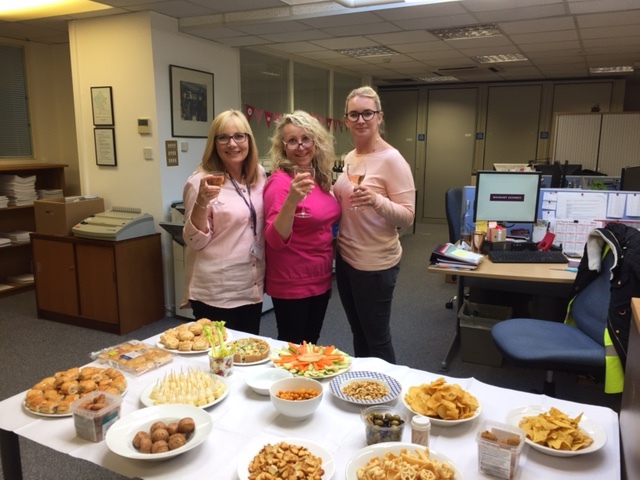 The Pink Ladies would like to thank Kelly and her team for raising funds following a recent coffee morning held at both their Rohais and Admiral Park stores. The Waitrose teams split their fundraising total three-ways so that different charities would benefit. Thank you very much for including the Pink Ladies !! The Pink Ladies would like to thank all at the St Martin’s Masonic Lodge for their generous donation of £400. Please click to see details about a charity ball organised by Travel Solutions supporting the Pink Ladies..... Please click here for more information. We want to get as many people who LOVE TO PARTY together, and help raise money for the Pink Ladies ! Please click here for more information. There will be a car boot sale at the Alliance car park on Sunday 31st March. What a perfect opportunity to have a good Spring clean and make some money at the same time ! No need to book just turn up, it is running from 9.30am till 1 o'clock. Cost is £5.00 a car. There will also be a Pink Ladies table so any donations are more than welcome. Our intrepid fundraiser Lee Dodd who is doing the Great North Run for us in September has joined forces with mum and they are holding a Car Boot Sale in Alliance Car Park on Sunday 26th August. Please click here for more information. Support Richard Vahey in his latest fundraising activity for the Pink Ladies on Friday 20th July Please click here for more information. 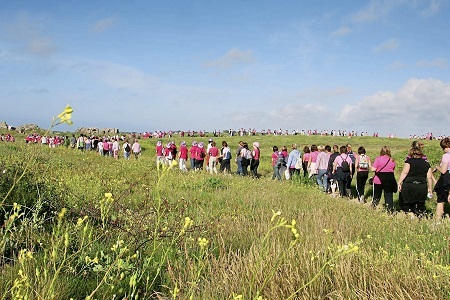 The Male Uprising in Guernsey (MUG) is a Guernsey Charitable Trust which has taken inspiration from the achievements of the Pink Ladies in the Bailiwick of Guernsey. MUG’s focus threefold. To increase awareness, promote education and raise £250,000 over the next three years. Funds will be used for research into testing, cures and treatments in the areas of prostate, bowel and testicular cancer. The aim is to get men, whatever their age, to be more confident, outgoing and questioning of their symptoms. They should also seek medical advice and assistance at the earliest opportunity as procrastination or delays can have deadly consequences. Women are also encouraged by MUG to nag the men in their lives to get tested! The fundraising ball takes place on Friday 18th May at the St Pierre Park Hotel. Tickets are £660 per table of 12/ £55 per ticket - book early to avoid disappointment ! Please find a booking form attached Please click here for more information. The Pink Ladies are asking all their supporters to sponsor Richard Vahey with several fundraising activities Please click here for more information. For lots of ladies, January is a time when they think about being more active and making healthier choices. The Guernsey Sports Commission are working with M&S to support women in Guernsey to find an activity that they enjoy. We will be offering a variety of free taster sessions 21st – 29th of January. These sessions are for all women (no minimum fitness’s levels) and friends can go together. Please click below to see what's on offer during the week. Hard copies of the leaflet will be available in M&S stores. Please click here for more information.